Diego S. Silva argues that local and international governments need to pay attention to what healthcare workers need to uphold their supposed duty to care during the Ebola epidemic. Public debate about current affairs often fixates on what ought to be the case, but enough time isn&rsquo;t given to thinking about how to bring about what ought to be the case. Given the mortality and devastation surrounding the recent epidemic of Ebola in Guinea, Sierra Leone, Liberia, and Nigeria, the topic of healthcare workers&rsquo; (both domestic and foreign) obligations to treat Ebola patients has become a central ethics question. The question most often asked is, ‘Is there a duty to care for Ebola patients?&rsquo; But is this even the right question? Aminu Yakubu and colleagues have recently argued that any duty to care on the part of healthcare workers disappears if they are not given adequate protection while caring for those infected with Ebola and that in such instances “the philosophy of ‘duty to provide care&rsquo; [is] inadequate as a moral guide&rdquo;. For example, healthcare workers in the affected region, who want to treat Ebola patients but lack personal protective equipment, may face extreme dangers (namely, becoming infected with Ebola) because of breakdowns in the local and international health systems. Questioning whether there is a duty to care during this Ebola epidemic, however, is not limited to academic journals but can be found in mainstream North American media and blogs and international media, too. 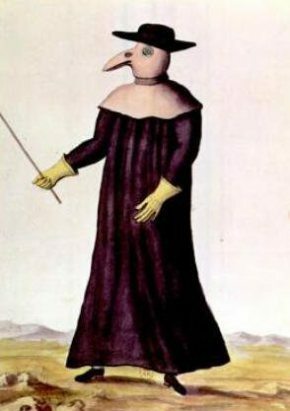 The beak doctor costume (1720).